Quick, go watch the Children in Need special before you read this! (and resist the urge to click through the million other YouTube clips of cool Doctor Who stuff). Right, you’re back now? I hadn’t seen this until Tansy pointed it out, and while it actually made the end of Season One a little less awesome for me (they KNOWINGLY left Jack to his own devices! After he was such a hero! ), it is a great bridge for the new incarnation of the Doctor. Ah, David Tennant. Who I was DETERMINED not to love, because all the fangirls do, but have to admit, he does rock pretty hard. I am glad I watched the CON special first, it was a great little bridge into the new Doctor and I was immediately impressed, despite the fact he seemed to be channeling Eric Idle for a little bit there! I am not sure what it was, but I warmed to him straight away … sorry, number Nine. I always forget about how much I like David Tennant’s Doctor. I like the rough edges of Eccleston, and I love what Matt Smith is doing with Eleven, but David Tennant is just plain adorable. I think part of me doesn’t want to like him because he is the most popular Doctor of all time (and for other reasons that will come up in later stories)… and Ten won Raeli’s heart away from Eleven, which is very impressive. But even though I don’t always like the material he has to work with, and the things his Doctor does, I do enjoy his performance. Heh, I’m the same, Tansy. I didn’t want to love him, simply because everybody ELSE does! I really enjoyed this episode – it’s actually fairly Doctor-lite, which I thought was interesting for the beginning of a new Doctor AND Christmas special combined. Rose, Jackie and Mickey do a pretty good job of carrying it though (though Mickey shows he still carries a torch for Rose, albeit in a bit more feisty way). It is odd how little Doctor we get – whetting our appetite, I suppose and it’s true that all “Doctor-lite” stories do tend to be more about the Doctor than any others, because of the whopping great hole left by his absence. I’m also not convinced that the Doctor we see here is actually the Doctor we’re going to get in the season to come – but that could be because of the pyjamas. 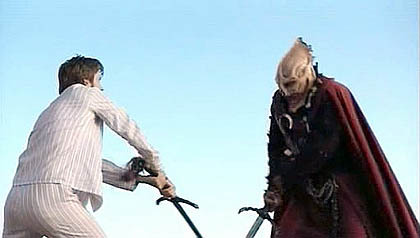 Maybe it’s just me, but it sort of felt like there were two different stories with the remote controlled Santas and then the Sycorax. I know they gave it a good explanation, but it didn’t really gel for me, even second time around. I was expecting a pretty fluffy episode, being a Christmas episode, but I actually thought this was very strong. The dialogue was exceptional, lots of great banter and funny bits without becoming farcical, and the special effects were of a extremely high standard. There is something about the subversion of things that are meant to fun or heartwarming that always creeps me out, like clowns, so the Santas and the killer Christmas tree gave me the heebie jeebies. And, the Sycorax were suitably menacing villains, if a little melodramatic at times, and certainly not shy of killing people! The robot Santas, killer Christmas trees and basically all the Christmas stuff feels very tacked on to me – it’s all lead up to the big dramatic Sycorax scene on the ship and I agree that it could have been anything leading there. It feels to some extent that the Christmas alien bumpf is more for the previews than the episode itself. But there’s enough heart and character story in between the silly bits that I’m prepared to forgive it, even if it’s pretty much filler until we get more bits with the new Doctor in again. I was amused when Rose called Nine the “proper Doctor” – I could hear echoes of fans after each regeneration! Rose’s reaction was very telling, wasn’t it? You could tell that she felt betrayed and abandoned by the Doctor and that she took him changing very personally indeed. I think it’s important that we saw that reaction – though as we’ll see in the season to come, this is the only time we get that reaction, which I think is a shame really. It would have been nice to see a more complex relationship between them based on her not entirely trusting that “her” Doctor is inside this new charming stranger. I like that aspect of their relationship in this episode very much, but we never see it again. Tansy, you keep telling me about more stuff I’d never heard of! Being a Doctor Who fan is really quite time consuming, isn’t it?! Yay for more Harriet Jones! I thought she was just fabulous in this, even at the end, which gives us a very good taste of where this particular Doctor stands on things like this. And which is interesting, given the end of the last episode, where Rose destroyed the Daleks and that was okay, but Harriet orders the Sycorax shot down and the Doctor destroys her career. I don’t know how I felt about that bit actually, especially the WAY he did it – ironic comment on women in high-powered jobs, or something else? This was actually very similar to a scene from Classic Who (Doctor Who and the Silurians) where the Doctor is seeking a peaceful solution to the conflict with the Silurians, only for the Brigadier to blow up their base due to his superiors seeing them as too much of a threat to humanity. This is despite the fact that the Doctor has tricked them into going back into hibernation and the immediate threat is ended. The Doctor’s reaction is one of extreme anger, and in fact he is still disgusted with the Brigadier in later episodes. While some incarnations have been less pacifistic, I think the Doctor has always seen violence as a last resort, when there is no other solution. So, the destruction of the Daleks would be acceptable by that logic, but destroying an enemy that has been defeated and is leaving, not so much. I thought Harriet Jones was excellent in this episode, and I laughed at her ID card wielding ways, but that ending wasn’t my favourite part of the episode. However, it is consistent with the way Doctor feels about humanity, he loves them but is quite often impatient and exasperated, even disgusted, with their (to him) primitive and violent ways. I don’t like the end at all, and I think it shows that this sweet, funny Doctor has a mean streak to him. It’s a long time before we see it again, but it is there, and it is very interesting. But I resent that he felt the need to take down Harriet Jones (and as we’ll see in season three, it was actually a catastrophic thing to do) and I think it’s worrying that he’s prepared to ditch the “golden age” that he crowed about. Messing with history because of his own ego? It’s quite an interesting thing to do in our very first episode with him – like you say, we don’t see it again for a while, but that’s a lasting impression to take with us into Season Two. It bothered me more the second time, because I really LIKE Harriet, and to see her destroyed that way, regardless of the future effects, is really quite horrible. The thing about Ten is that there are few people who are prepared to call him on it when he’s wrong, and I am sad to see Harriet kicked in this way because she does do that, and it’s terribly brave of her. The fact that he uses that weird sexist psychological thing against her is discomforting, too. We really needed some Donna in this episode I think! Oops, sorry David, no spoilers! Is this the first time we see the sort of thing Torchwood might be? References to Torchwood are a recurring theme throughout this season and I don’t want to say too much about that yet, but this is the first mention of Torchwood (apart from a quiz question back on the Weakest Link) and the big gun zapping the aliens out of the sky is definitely… one side to what Torchwood is. But by no means the most interesting side! Oh I forgot to mention before, I think the Tenth Doctor’s relationship with Jackie and Mickey is worth noting because it’s such a contrast to Nine’s attitude. Nine was rude and abrupt, refused to have anything to do with domesticity, and for the most part was antagonistic towards Rose’s family. But Ten embraces them as his own, and for the most part he has a far more positive attitude towards humanity. It suggests that this Doctor is less emotionally scarred than the previous incarnation (though of course he’s screwed up in whole new ways) and may be a step further away from the horrors of his past. But there’s also a popular fan theory that the Doctor subconsciously moulds his incarnations based on a perceived lack in the previous version… and that he designed this particular body and personality with Rose in mind. Thoughts? Is that romantic, or icky? Is it even plausible, given the surprise with which he always greets his new body? I think some fans have waaaaay too much time on their hands, coming up with theories like that! I’d be surprised if it’s not conscious in the writers though, adding new dimensions and changes to appeal to a slightly difference audience range each time? This entry was posted in Geek, Pop Culture, TV and tagged Doctor Who, New Who Conversations, Tansy Rayner Roberts, Tehani Croft Wessely on October 5, 2011 by David.